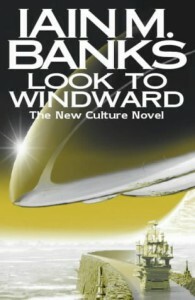 Look to Windward, Iain M. Banks, Orbit / Futura, 2000, ISBN 9781857239690, 357pp. 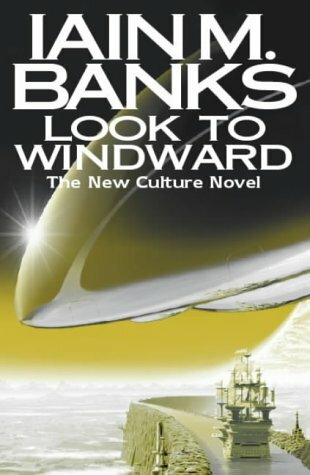 Look to Windward is the seventh book in Banks’ science fiction universe based on a utopian society of advanced artificial intelligences and the humans (and other organic life forms) that originally created them, loosely termed the Culture. With each book, Banks has built his plots out of the interstitial area where the idea of this utopia fails, typically in its dealings with other, different societies, through its para-military/intelligence arm called Special Circumstances. This time, the Culture has interferred in the “advancement” of another society, failing miserably, and then must deal with the diplomatic fallout from their actions. That the other society, the Chelgria was a predator-based race with a rigid class structure and a warlike demeanor, makes this all the more difficult. On this backdrop is placed several interesting characters: the Chelgrian Ziller, a composer who has ex-patriated himself because of his support for the rebels who attempted to overthrow the class structure, and wishes to have nothing to do with his old society or race; the Chelgrian emissary, Quinlan, whose despair over losing his wife in the war between the traditionalists and the rebels will drive him to commit the unthinkable; and the orbital Mind known as Masaq’, who has hosted Ziller for years and asked the composer to create a new symphony based on the fading light of two suns–suns that went nova two thousand years ago when Masaq’, as a warship, set off a chain reaction that destroyed them and the two orbitals around them. As in his other novels, this one has several storylines to follow that eventually come together by the climax. Each storyline is given its own chapters, which some people find difficult to follow but I’ve always enjoyed, although it makes keeping track of the story much more difficult when the time spent reading the book occurs over weeks rather than hours. It’s not that Banks brings anything new to science fiction in his Culture novels; even the Culture itself can be found by looking at some mixture of Cordwainer Smith and Isaac Asimov. His ideas are culled from the classics as well, as in this book the orbital is roughly Larry Niven’s “ringworld” mixed with John Varley’s world-mind Gaea from his Titan trilogy. But what Banks can do better than those four, and a host of other published SF writers, is create believable characters whose motivations mesh with the unlikely locations and situations he sets for them. There’s a reason why this type of SF is called space opera, but in Banks’ hands it refers not to the televised soap operas but the sturm und drang of classical music. Yes, there are exaggerations here, but when a Banks’ character has amnesia, it becomes a thematic device, not just a crutch to get you from one chapter to the next.